The NSMBA 10for20 Raffle is over! 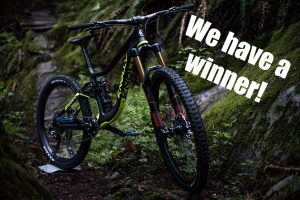 After 6 weeks, the NSMBA 10 for 20 Bike Raffle is over! Congratulations to Scott Baker, (ticket # 03438) who won the draw and is now the proud owner of the Knolly Warden Carbon! The Winner was drawn via RNG using Darelle systems on Saturday June 24th at 9pm at the Narrows Pub in North Vancouver. Thank you to everyone who contributed to the fundraiser! Your tremendous support and generosity allowed us to raise over $30,000 for the trails! The community is stronger than ever and there is no doubt that we will see another 20 years of the NSMBA and the continuation of trails for all, trails forever! Thank you also to Darelle Media for your support in helping us run the raffle! And finally, thank you to Knolly Bikes, Race Face Performance Products, Shimano-MTB and FOX for bringing the Warden to life and making this all possible!